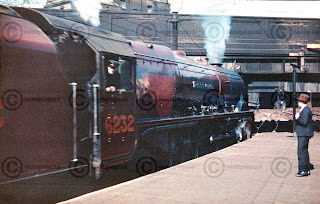 Euston, almost three quarters of a century ago, and London Midland and Scottish Princess Coronation class 6232 Duchess of Montrose starts away on on what looks to be a blisteringly hot day. The fireman looks back along the train and the banner repeater signal just visible above the front of the locomotive shows that the signal ahead, but out of sight of the driver is clear for start of the long run to Scotland. She is almost brand new, having been built in July so this is possibly one of her first runs. She would last until December 1962. She has been gone almost fifty years now. This is another of Sydney Perrier's Dufaycolor transparencies. Three of these locomotives have survived and two have run on the main line in the past twenty years or so. One, 6233 Duchess of Sutherland, coincidentally the next numerically from this engine, is still steamable and runs on the main line having recently been overhauled while the other two reside in museums. As we have a run of four hundred miles or so to Glasgow we should perhaps retire to the restaurant car for refreshments to pass away some time. There is something rather relaxing and indulgent about dining on a train as the countryside speeds past.